Watford midfielder Abdoulaye Doucoure has spoken about his old team-mate Paul Pogba as he prepares to face him and Manchester United this weekend. The France international is going through a difficult period at Old Trafford, with his future somewhat in doubt and with criticism coming in from all quarters. 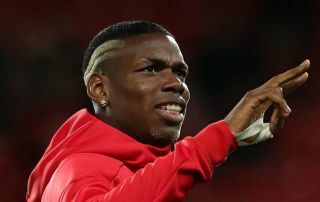 Many feel that Pogba has not shown his best form since moving to United in 2016, despite looking a real world-beater at Juventus and for the French national team as they won the World Cup this summer. Some have accused the 25-year-old of being too flashy – both in his performances on the pitch and with his social media antics off it, but Doucoure believes it’s good to see players like him with charisma offering something different. The Watford ace and Pogba go a long way back, having played together in the France Under-16 team, and he told the Daily Mirror that Pogba has always been a bit of a show off, but in a good way. ‘I’ve known Paul since I played with him in the French ­Under-16 team and he was, physically, the same as he is today, because he was in advance of everyone,’ Doucoure said. ‘Yes, he liked to show off a little bit, but he’s a very nice guy, very natural. ‘Today there is a ­different ­dimension ­because Paul is a ­superstar, but as a ­character he has ­always been the same – he likes to laugh, he likes to speak about ­everything. We still speak sometimes, and I sent him a message to ­congratulate him on ­winning the World Cup. He added: ‘I think he has this personality because he is good on the pitch. United fans will be hoping to see a little more substance from Pogba as the season goes on, with the club needing its best players to perform after two defeats from their first four games.